Breakfast 7:00 to 12:00. Closing Summer 9-10:00 Sun-Thur & 11:00 Fri-Sat. Winter closes 9:00. For Breakfast, Lunch or Dinner, dine where the locals have been coming for over 37 years. Tacky Jacks has been awarded the People's choice award for Locals' Favorite Hangout, Friendliest Staff, Best View of the Island, Best Island Atmosphere, Best Happy Hour and Best Overall Bar. We are open 7 days a week and you can visit us ''By Land or By Sea'' with lots of boat parking. Breakfast features our famous Farmer's Omelet which is on the State of Alabama's list of one of the ''100 Dishes to Eat in Alabama before you die''. Lots of choices for Lunch and Dinner including generously stuffed PO-boys, sandwiches and wraps, half pound burgers, fish tacos, chicken, steaks, seafood and seared tuna salads, ''Tacky Shrimp'', oysters and fried, blackened or grilled seafood. You can come anytime and enjoy our unmatched appetizers including Firecracker shrimp, Fried Green Tomato Fries and our enormous Mexican Garbage Nachos (enough to share with the table). 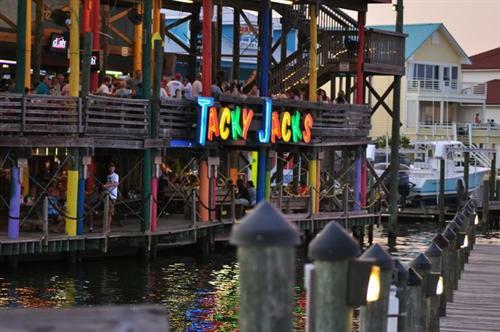 Of course, no trip would be complete without our famous Tacky Jacks Bushwacker. Enjoy Live music Thursday thru Sunday. 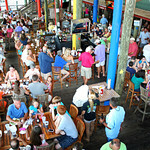 Lots of decks hang out over Cotton Bayou and from our Observation Deck above the restaurant you can see forever. 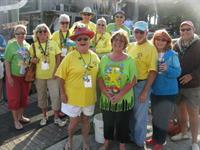 Adult fun but always family friendly at Tacky Jacks. Good Food, Good Music, Good Times! 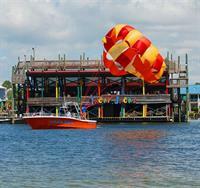 Tacky Jacks Orange Beach- 27206 Safe Harbor Dr. From 161, turn onto Marina Road. At large Tacky Jacks sign turn right onto Safe Harbor Drive. 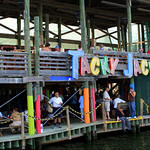 Tacky Jacks is on right at end of Safe Harbor.